A treaty’s anniversary opens a way for Navajo people to confront their memories of the Long Walk—and for all Americans to heal from it. 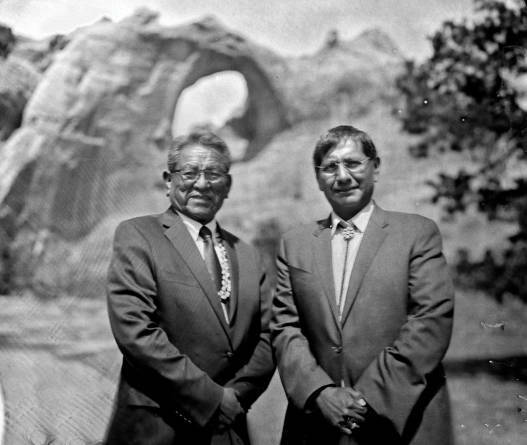 Above: Navajo Nation President Russell Begaye and Vice President Jonathan Nez at Window Rock, Arizona, in the heart of the Navajo Nation. Tintype by Will Wilson. EVEN NOW, stands of cottonwood, willow, and mesquite marking the course of the Pecos River offer but a tangle of weedy limbs. Around the onetime military post of Fort Sumner, on New Mexico’s eastern plains, the bosque has had more than a century to grow taller and thicker. Stand here, in the timeless hush, and you can sense history’s heavy weight. The vast sky promises resilience, freedom, and home. But the stark land bears witness to a bleaker past. On this ground on June 1, 1868, General William T. Sherman and 29 Navajo leaders negotiated an agreement to end one of the darkest chapters in the American story. At the then-40-square-mile expanse known today as Fort Sumner Historic Site/Bosque Redondo Memorial, the Navajos left their X marks on a document outlining a host of requirements in return for the right to go home. Hundreds of miles from this barren place stood four mountains, in New Mexico, Arizona, and Colorado—the boundaries of a sacred space within which Navajo people believed they were always meant to live. From late 1863 to 1868, they instead endured a dislocation bred by the zeal of Manifest Destiny. From the day that they began their Long Walk home, the Navajos, or Diné, rarely spoke of Hwéeldi, their name for “the suffering place.” Never go there, children were warned. But as their defining treaty reaches its 150th anniversary, stances are shifting. Fort Sumner and Window Rock, Arizona, capital of the Navajo Nation, will host commemorative events. The state-owned historic site plans new exhibits using the voices of those who were imprisoned—Navajos and Mescalero Apaches—rather than those of curators and historians. As museums and historic places around the world similarly retool their explorations of divisive histories, Bosque Redondo prepares to become a place of inclusion, one with, perhaps, the power to heal. IN THE 19TH CENTURY, as U.S. leaders asserted control over the American West, clashes erupted. New Mexico’s tribal peoples had long weathered times of trouble and peace with Spanish colonists. Now disorder reigned. The resulting years of land grabs, raids and counterraids, massacres, broken treaties, and slave trading have fed—and continue to feed—a library’s worth of research. Into this milieu stepped General James H. Carleton, armed with a national mission to subdue the Mescalero and Navajo peoples. In 1862, he ordered Colonel Christopher “Kit” Carson to kill all Mescalero men and move the women and children to Bosque Redondo—a new reservation that others had warned could not sustain crops and was far too remote. Carson instead persuaded Mescalero leader Cadete to surrender and, with more than 400 of his people, leave the Sierra Blanca Mountains, near today’s Ruidoso. In January 1863, they stepped onto land long claimed by Comanche and Kiowa peoples at Fort Sumner, a set-up too new and too ill-prepared to feed or house them. Six months later, Carleton ordered Carson to attack the Navajos in today’s Four Corners region. The campaign led to a scorched-earth siege across the winter of 1863–1864, during which starvation became a tool of war. Bands of Navajos, weak and ill, started surrendering in 1863. By 1866, around 9,000 people had endured the Long Walk to Bosque Redondo. Unknown others remained in hiding. The 53 forced marches over three years, as the Diné surrendered or were captured, have been called New Mexico’s Trail of Tears, echoing the relocation of southeastern tribes in the 1830s. At least 500 Navajos died en route. They could lose all their supplies crossing the treacherous Río Grande. Some people drowned. Elderly people or pregnant women who couldn’t keep up were shot. They walked in high heat. They walked in snowstorms, struggling to keep their horses and sheep alive. They didn’t know how to prepare the rations of unfamiliar foods—flour, bacon, and coffee—so ate them raw, then fell ill. The soldiers vowed that better conditions lay ahead. And so they walked. At Fort Sumner, they were met by the Mescalero, a tribe they had long warred against. With the nation consumed by the Civil War, supplies came rarely. Food turned rancid. Tribal men built housing for the military, even as their own families lived in tattered tepees or holes in the ground. The Navajos languished at Bosque Redondo, too ill to risk a months-long escape through hostile communities. Up to 1,500 of them eventually lay in unmarked graves. U.S. leaders fumed at the million-dollar annual cost. Carleton lost his command in 1866, after which legendary warrior Manuelito and two dozen of his emaciated followers finally surrendered. In 1868, the Navajos refused to plant crops. They had given up. They stood in lines awaiting rations. The reservation had failed. MORNING SUN WARMS THE SHEER red-cliff backdrop of the Navajo Nation Museum, in Window Rock, as tribal members filter in for an important meeting. On this day, in the late winter of 2018, President Russell Begaye, Vice President Nez, and other officials will sign a proclamation declaring 12 months of treaty commemorations and promise to fund the delivery of the original treaty from the National Archives for a month of public viewings and events. Surrounding them are 27,000 square miles of Diné land, far more than the 5,200 square miles granted in the treaty. More than 350,000 people claim Navajo affiliation. Navajo weavers and silversmiths rank among the world’s best. A massive agricultural enterprise and extensive mineral resources support the tribe’s economy. Yet poverty gnaws at its people, along with environmental challenges, encroachments on sacred places, and the erosion of traditional ways. At five foot eleven, he weighed 300 pounds. That was 2011. He and his wife threw out processed food, and he started to walk. Then he ran. Today he completes marathons and trains for 100-mile runs. He’s lean and healthy and speaks a gospel of starting over. Around the last week of May, he’ll lead a group of runners—anyone who wants to come along—from Bosque Redondo to Window Rock. He figures the 300-mile Long Run will take a week. A small flock of churro sheep—the traditional, revered breed of Navajo people—grazes at Fort Sumner, and that gave Argeanas an idea for a project to earn his Eagle Scout badge. He raised money to pay a Shiprock weaver to turn the sheep’s wool into a traditional blanket dress for the historic site. He also commissioned signs to explain the sheep’s role in sustaining his people. We find Fort Sumner Historic Site discriminating and not telling the true story behind what really happened to our ancestors in 1864–1868. It seems to us there is more information on Billy the Kid, which has no significance to the years 1864–1868. We therefore declare that the museum show and tell the true history of the Navajos and the United States military. We are a concerned young generation of Navajos for the future. Twenty young men and women signed their names. Site staff found it, and the plea turned into a legislative push. It took time, but in 2005 the Bosque Redondo Memorial debuted a futuristic building that blends elements of an Apache tepee and a Navajo hogan. In 2017, officials from the historic site began meeting with both tribes in order to reconfigure its exhibits so that the voices of Mescalero and Navajo people dominate. Tours will delve deeper into that history, and students will get hands-on experience in building shelters and other survival techniques. The new exhibits will take form in 2019, but visitors this summer can see conceptual drawings and hear the first cache of oral histories gathered for it. One thing that won’t change is a set of murals curling through a hallway between exhibit areas. One side features the work of self-described “cowboy painter” Mike Scovel, who illustrated the military side of the ordeal. The realistic style he chose grows more chilling by a trick of the convex side his mural is on. No matter where you stand, the soldiers’ eyes follow you, as do the tips of their guns. It manifests a sense of the constant paranoia tribal people must have felt. Even so, Scovel hints at human complexities: A soldier bends to pick up a dropped doll; another offers a canteen of lifesaving water as a superior lunges toward him, the word “no” on his lips. Beyond the memorial building, a trail connects what’s left of the military buildings and a parade ground, the sheep pasture, a river path, and two monuments to the tribes. One is participatory: the pile of stones, with mementos left by visitors. Kachinas. Feathers. Money. A Purple Heart. A casino chip. A sobriety medallion topped by a pinch of white cornmeal. The other was built in 1994. It bears a plaque with words by former Navajo Nation President Peterson Zah. In Diné, it tells of the people, their language, the four sacred peaks, and the strength of the clans. It ends, as all Beauty Way prayers do, with four repetitions of Hózhó Náhasdlíí’ (“Beauty is restored”). Begay stands before it and silently removes his turquoise earring, placing it on top. The soil around him is saturated with people’s suffering, but by their prayers and offerings, he and the others who come deliver a balm to the past and an oath to the future. We survived this, they say. We are here. We remember. Bosque Redondo, Spanish for “round forest,” was likely named for a pool of water near the Pecos River. Before Spanish settlement, various tribes used the relatively sparse region for encampments; it may have served a Council Grove–type purpose. General James H. Carleton named Fort Sumner for Civil War colonel Edwin Vose Sumner, who had established other forts in New Mexico. Before his 1863 death, Sumner advised against the fort that came to bear his name. Events marking the 150th anniversary of the Navajos’ 1868 treaty with the U.S. government kick off the week before the annual June 1 Treaty Day, when Navajo Nation Vice President Jonathan Nez leads a Long Run from Fort Sumner to Window Rock, Arizona. Participants can tackle the entire route or just a portion. For details, go to nnsdp.org. Among June 1 festivities in Window Rock, the Navajo Nation Museum displays the original document for a month, with lectures and other events throughout the year (Arizona SR 264 and Loop Road, 928-871-7941, navajonationmuseum.org). On June 8–9, the Fort Sumner Historic Site/Bosque Redondo Memorial offers a sneak peek of its planned exhibitions, plus traditional dances, foods, artisans, and speakers from tribal and state governments. A 6.5-mile walk and run from the memorial to Fort Sumner High School symbolizes the Long Walk (3647 Billy the Kid Road, Fort Sumner, 575-355-2573, nmhistoricsites.org and bosqueredondomemorial.com). Year-round, the historic site is open for free Wednesday–Sunday, 8:30 a.m.–4:30 p.m. It includes a small museum, shop, picnic area, the Old Fort Site Trail, and a 3/4-mile river walk.